I know, I know, South Park is really immature and rude. However, there is one episode in Season 10 that is just hilarious and it actually brings up a lot of good science questions. For those of you who follow South Park, this is the episode where Cartman freezes himself so he can go into the future and get a Wii. For those of you who don't, I'll give you a quick summary. One of the characters travels to the future and ends up in the year 3000. He discovers that in the future there is no religion. However, instead of fighting religious wars the citizens are fighting science wars. There are several different science groups, such as the Atheist Alliance, and they are all at war over who is more logical and who has better scientific answer to life. I think that this is a pretty accurate prediction for the future. Once people have stopped fighting over religion, we will still fight about something! It seems to be human nature to start wars and argue. People seem to think that a life without religion would be perfect (I'm not religious myself) but would that really be any better? I think that scientific beliefs would just replace our religious beliefs. In the episode, instead of saying "Oh my God! ", the future people say "Oh my Science!" Richard Dawkins, an uber famous evolutionary scientist, actually plays a part in the episode too. When the school teacher is forced to teach evolution, he claims that humans were descendants of 'retarded fish frogs that became monkeys'. The teacher gets fired and Richard Dawkins takes over to teach the class. Of course, people aren't really the descendants of fish-frog-monkey things...at least not in those words. 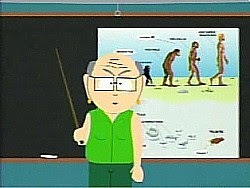 When the concept of evolution came out, I'm sure that the general public thought it was scandalous and unbelievable. Now it seems to be the opposite. The general public (In Canada, at least) seems to believe in evolution, and although we tolerate the idea of divine creationism we do not (for the most part) believe in it. It is interesting to note that many religious private schools are now required to teach both theories of evolution. I guess that I enjoyed the episode so much because it made me think of how evolution will effect us in the future. I am not so much interested in where we came from but rather where we are going to be in 1000 years. Will religion exist? Will we have destroyed this planet and relocated to another one? For those of you who want to check out the episode, be warned that it is graphic and offensive. However, the storyline brings up a ton of good points. PS) Q: What did the male stamen say to the female pistil?